we indeed had great day around this project. Demonstrated lohit-ise concept with Samyak Devanagari fonts due to time restriction we only modified the single combination of Samyak Devanagari but i hope that was sufficient for understanding concept. I hope Sneha  will do further blogging with nice images on how we actually done this demonstration. Steps are already available on my earlier blog. Looking forward this to make good impact on some of the available fonts around. But i think still people will take time understanding usefulness of this. So we need to provide clear details on what things got improved and how it will help in longterm after lohit-ising fonts. This project is around now for 2+ years and number of feature developed considering users requirement. Anish started nicely with the need behind this project with me presenting on feature of typing booster. Thanks a lot to Vasudev again for trying installing ibus-typing-booster on Debian. I am hoping he liked the project and will give some more inputs and contribute more. I tried last two time test day of itb and this is first time when all participants appreciated project and said the need of more intense testing of this may be for couple of hours. This is really motivating. I am setting up project page for it. These are steps we followed in session for lohitising open type fonts. 5. open yourfonts .sfd and update glyphs names as per lohit fonts. Things to note here apply_featurefile.py only import gsub of lohit project, it will keep gpos tables intact. There are number of benefits of lohitising open type fonts, i will write separate blog on it with proper implementation example. First day of language summit and things achieved. Started with explaining basic idea behind Lohit2 project. Next we had excellent discussion again on Adobe Glyph Names. I am sure i made concept very clear but still there are some plus and minuses with AGL. In the next conference around Typography i am surely would love to talk in details regarding it. Aravinda  explained his blog wrote on lohit2 kannada and gubbi and navilu font development. I loved his idea for having script for generating AGL based names from user friendly name. In long term if we can have such script useful for building .sfd to .ttf and automatically all fonts build with fontforge will become AGL compliant. Sneha explained on steps followed to develop Devanagaria ang Gujarati. These steps are very helpful as we are going to follow same for all other script fonts. I hope sneha would like to blog about same with more details. Santhosh exaplined Gsoc project for automatically testing fonts rendering. Earlier i had different perspective on this project. Since We are already following test suite in Harfbuzz developed by Behdad. Here first step is different. i.e. font developer suppose to create correct combination standard file. Then we will pass unicode text to hb-shape and compate o/p with out standard file. Done some plans for future development and done. This session was good, as i think first time Fedora and Debian package were in front and discussing how we can improve. It was good to have me, Parag, Karthik and VasudevK here. Thanks VasudevK  for creating track request  for packing ibus-typing-booster in Debain. I am sure after learning about this project more Debian users will request for having itb in Debian. Looking forward to attend Behdad's session on Harfbuzz via Google Hangout. Almost start of the open source lang summit 2013. I think this is good time to list down things i am expecting from this summit. If you had chance to gone through my earlier blog  on the sprints plan for this summit, you might be already know the activities i was planning. Happy that all my sprint plans are got accepted and excited to work on it. 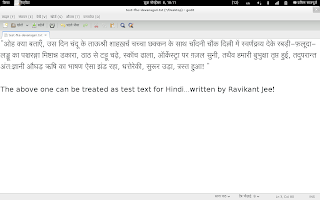 Devanagari Beta is out last week and Gujarati Alpha is yesterday itself. Hoping we will have some more thorough testing for same. First of all i need to explain the concept clearly. Once that is done and there will be no doubts, we will try to implement it on Samyak fonts and if contributors are interested will help to implement it on other fonts. Time to update font packages in major OS distribution. One can learn packaging through this sprints. Expecting experts from different distribution packaging team will be there to help. I am sure we will have at least srpm ready for these packages for Fedora. Hoping debian packagers attending here will also able to push up .deb packages. Now sure about this yet. :( So looking around Debian and Ubuntu packagers. Porting ibus-typing-booster to fcitx is not required as fcitx following little bit different architecture. Thanks for fcitx main developer for explaination. I am excited for this. I am damn sure attending will have so much to take out after this sprint. Plan is to create layout images for inscript2 layout. Parag is going to lead this session. Looking forward we will have something handy and helpful in this session. 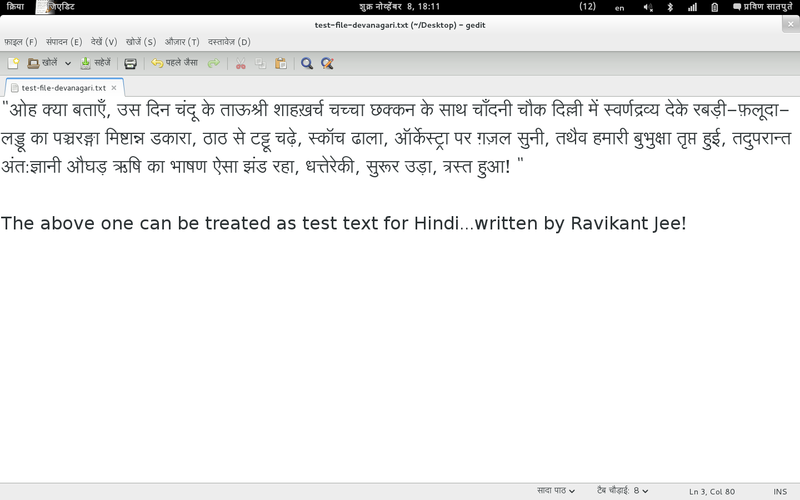 Lohit Devanagari Beta release test file screenshot ! !